Two e-books today – but that’s all they’ve got in common. After my slightly panicky post about getting stuck, I have been making the effort to finish books I’m half-way through before starting more, and things certainly have freed up a bit now I’ve got “The Heavenly Twins” finished. Having said that, it was a jolly good read and I’m very glad that my friend recommended and lent it to me! I’d been half-reading “Ten Pound Pom” for a while, too, so was glad to get that one done and dusted, and the Kindle TBR has gone down as a result, too! One of the first of the ‘New Woman’ novels of the 1890s (in fact, according to the introduction in my paper copy, Sarah Grand coined the phrase! ), this is a hefty but rewarding tome which explores love, marriage, education, gender relations, moral equality, heredity, sexually transmitted diseases, friendship, goodness and decency, all in the one volume (originally published as a triple-decker, although I’m not sure that would have helped much!). This can make it feel a little ‘baggy’. Added to that, the structure is unconventional, darting between the protagonists, leaving the twins of the title alone for much of the narrative, which centres on them and two young women entering the marriage market and encountering very different forms of bad marriages, with the entire final section narrated by one of the previously somewhat minor male characters. But then, the people and situations that it portrays, from syphilitic babies through abandoned mistresses and cross-dressing heiresses to made wives – are somewhat unconventional for the time, too. Having made it seem like a worthy tome covering the Issues Of The Day, I will now say that it’s also very readable! It tells a good set of stories with engaging characters (particularly Angelica and Diavolo, the twins of the title), who are not just ciphers imbued with random characteristics and perspectives for dry pedagogical purposes, but are in the main rounded and interesting in their own rights in addition to being representative of various human states and fates. We’re forever darting below the surface of major and minor characters to examine their backgrounds, attitudes, motives and feelings, which makes for an entertaining and thought-provoking read. It’s not as simple as woman good / men bad, and shows the nascent movement towards women’s education and growth, particularly personified in the character of Evadne, self-educated to a degree and capable of thinking for herself but battered by the limitations of the patriarchal society in which she finds herself and without quite the resources to protect herself. There’s a good introduction which, like the paper edition itself (reproduced smudgily from the original printers’ plates and annotated charmingly with student notes by my friend), is a work of classic 1990s reclamation of women’s narrative works, quoting Showalter here and other feminist writers there – a bit of a trip down memory lane for me in that sense. 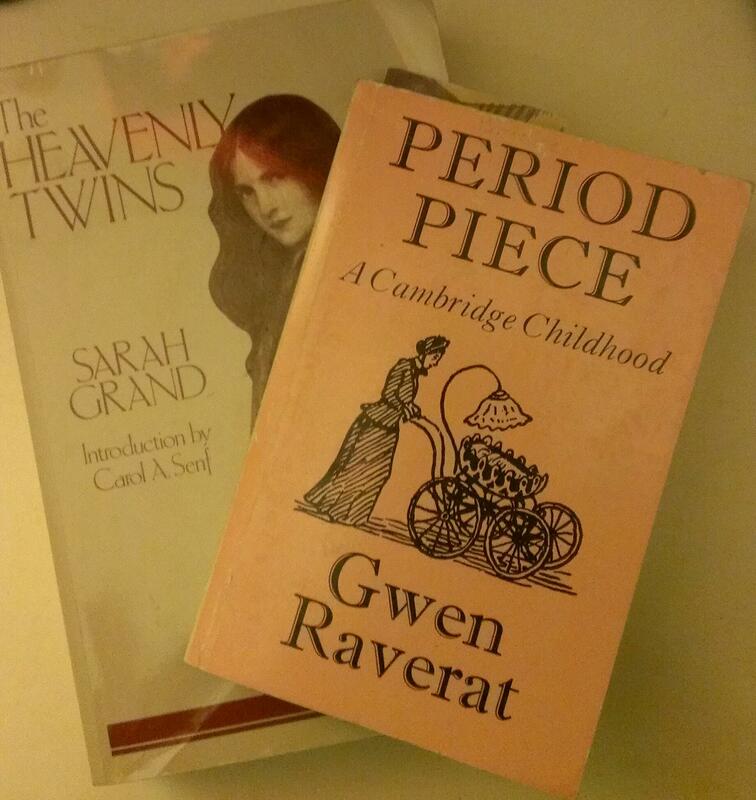 Read this if: you like reclaimed women’s writing; you are interested in gender relations and social history; you have read other ‘New Woman’ writers like George Gissing; you like a good story and don’t mind a few lessons and morals planted along the way. I do tend to download bargain of the day Kindle books, and this was presumably one of those. A dual narrative of the author’s pre-adolescent trip to, stay in and journey through Australia with his family in the late 1970s alongside his Noughties return to the country with his brother and various companions from their Australian days to retrace their steps and see if anything has been left that they recognise. Interesting contrasts are thrown up and there is much musing on the connection between his childhood and current selves, especially when confronted with buildings, monuments, signs and views which have remained there, unchanged, in the interim between his visits. The language is informal and I got a little annoyed with the use of “tho” for “though”; there were also a few slightly traumatic scenes from his childhood memories involving animals (nothing unbearable, though) (tho). It was competently done and interesting to a point, but it ultimately left me a bit cold, perhaps because of the masculine drinking culture and preoccupations, perhaps because I read it in bits and pieces. Read this if: you like travel books, dual-time narratives, books by men. A quick note for completeness’ sake that I read Tucker Max’s “The Bookstrapper’s Guide to Book Marketing” in pdf format, which was sent to me by the author after I saw an offer in a podcast transcription. I enjoyed this book and found some good tips in it, however there were some issues with links and it’s actually been (temporarily) taken down from bookselling sites, so I’m not going to recommend it right now in case you can’t go off and find a copy for yourself. I’m currently reading Iris Murdoch’s book on Sartre (yes, I am reading it, finally!) and That Is It for the moment, so then I’ll have a clean slate again. What are you reading? Have you read the Sarah Grand or any other ‘New Woman’ novels? Do you like my new “Read this if” feature or do the reviews tell you that anyway? An absolutely charming book of reminiscences about her childhood and young womanhood in Cambridge, full of loving and affectionate portraits of family and friends, including a long section on her beloved uncles and aunts. It’s really evocative and charming without being twee or sentimental, clear-headed about people’s faults and foibles but celebrating their differences. Wonderful descriptions of people, houses, gardens and the countryside are accompanied by adorable illustrations with amusing captions. She is, of course, known for her art and especially illustrations, and it’s lovely to see them here, alongside her own writing. I must have read this before (although if I did, it was before online blog records began, maybe even before the paper journals began) and it is certainly a book – as a classic of childhood memoir – that I will return to again and again over the years. This has handily also filled in 1952 on my Reading a Century project! A collection of Moran’s newspaper columns which was clearly put out to build on the success of her “How to be a Woman” but was to me actually a more enjoyable and engaging read. When I reviewed the earlier book back in 2011, I wasn’t sure what I thought of it, and I’m left with a memory of lots of rude bits (or reclaiming of woman’s right to talk about whatever she wants to talk about) and a bit of missing out on the idea that other people of the same age could have similar ideas. This one is more inclusive, more conspiratorial, even, and more enjoyable for that. There’s a good mix of the silly (and very funny), the (very) serious (and on occasion tear-inducing), the very perceptive but not nasty (for example on the Royal Wedding and the tweets around it) and, probably her best pieces, those that draw on her childhood experiences of poverty and draw parallels with events, policies and perceptions that are happening right now. Those are the most powerful pieces in the book, and really have something important to say. With additional framing comments which fill in the context and in particular delightfully describe her early attempts at journalism, all is well-written and highly competent, with probably just the appropriate amount of the read-out-loud hilarious. 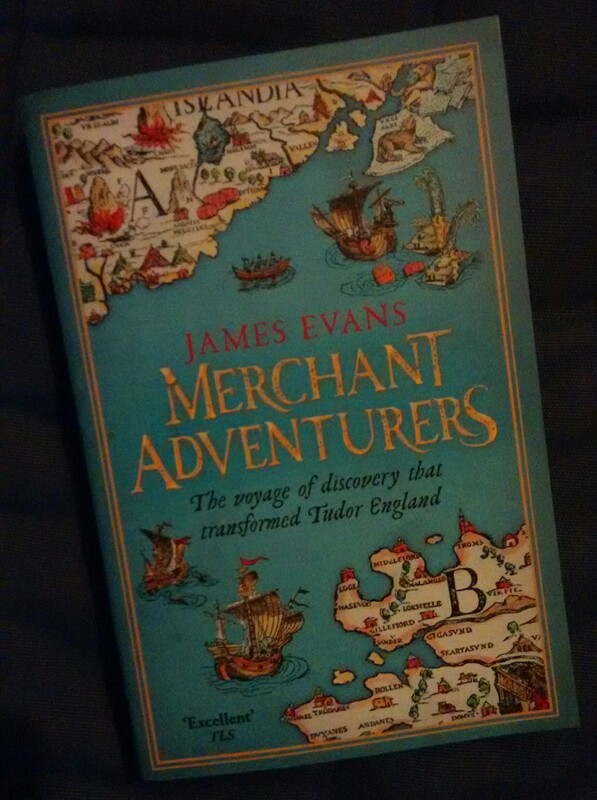 Just in – I was asked by the lovely folk at Shiny New Books (which is an excellent new books e-magazine, packed full of recommendations and reviews by readers just like you and me, with high production values and so much care lavished over contents and appearance) to review James Evans’ “Merchant Adventures”, out in paperback in November. I’m VERY picky about review copies, knowing only to ask for one or two if I’m sent a catalogue, taking on the rare random offer, reviewing books by writers I know are good or suspect I will like, and only requesting LibraryThing Early Reviewers books that I know I’m really interested in – all this not because I’m snooty or arrogant but because I’ve seen too many friends and bloggers drowning in a sea of review copies. However, Simon at SNB knows me well, and when they were offered this book about Arctic exploration in the Tudor Age, he suggested it to me and I gladly offered. I’ll flag up when my review is out in the January issue; in the meantime, do go and explore the current issue. There are Christmas lists to put together, aren’t there. 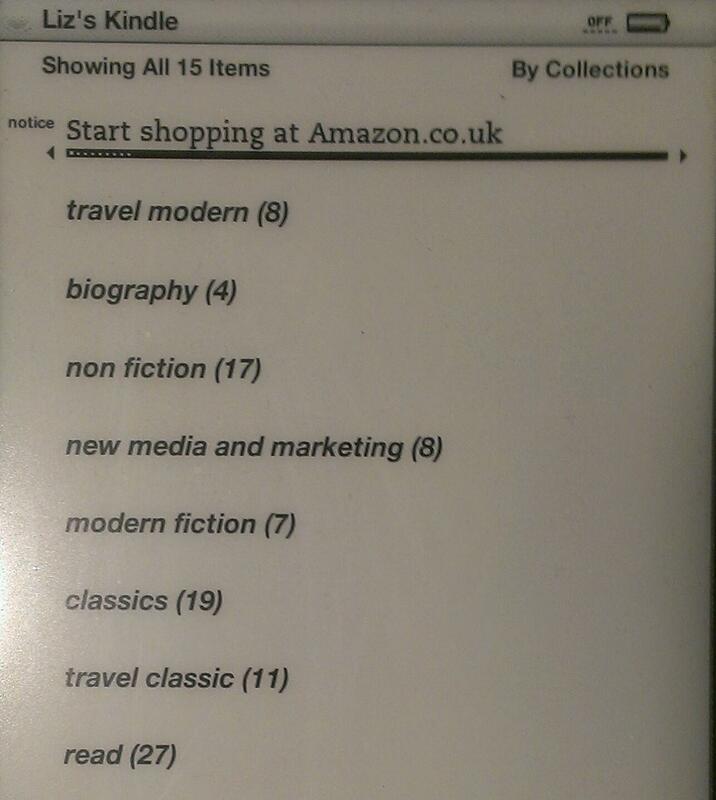 Talking of Christmas lists, I have moved my Wish List from Amazon onto these pages. I do try not to buy from Amazon these days (although I do sell my books on there; I have statements about that on my book website), so it felt weird to keep my Wish List on there. So I laboriously copied it and rearranged it, took some things off it, and here it is! It’s coming up to Secret Santa season, so I’ve updated all of my TBR and the books reviewed here into my LibraryThing library (however, I do have about 150 books to mark as “read but not owned” and deaccession, as I’ve decided I’m not going to re-read them – but these do not affect the Secret Santas too much, as they will just shift categories in the collection). What are you reading at the moment? One at a time, or all together? Current reading: As of this morning, I’ve finished “The Heavenly Twins” – I did SO much better once I’d found it on manybooks.net (a great resource for free, out-of-copyright books which you can download in a variety of formats) and got it on my Kindle rather than lugging the huge paperback around (however, I’m going to have to remember to go back to that for the introduction). Have you got stuck in a big book or otherwise into a reading rut recently? How did you climb out of it? I’m certainly considering picking off a few smaller ones once I’ve read that Introduction! I don’t know when I got this one (IS there a way to tell?) but I can imagine that it was either free or 99p, and for that I am glad. Sorry! The book covers a long period of time in the life and career of this chap, who has various bookshops in the UK and France and also buys and sells books on the fly. This should make it very interesting, and indeed it would be interesting, were it not for the terribly annoying structure of the book. The author has unfortunately seen fit – and on purpose, as he carefully explains in a section appearing late in the book which might have done better near the beginning (I wonder how many people actually make it to the end!) – shuffles everything around into disconnected chunks, yes, with the date at the top, which saves it from being utterly and completely confusing, but still very annoyingly. It’s not like one of those time-shift novels in which everything eventually makes sense: you get something from the UK in the 80s, then you’re in France in the 90s, then a year or two earlier, then off somewhere and some time else. It then becomes a series of disjointed vignettes, which are well-written and interesting in their own right, but it’s like reading random entries in a blog (maybe that’s how it was created) and you end up reading something mentioning an episode which doesn’t itself appear until several tens of percentage points further on in the book (remembering that I’m reading it in Kindle form). It’s a real shame, as it would have been a good book if it was shaped into a coherent narrative, but I lost most of the enjoyment through the skipping around. I’d heard about this woman’s epic and practically unsupported run around the world (she was sponsored by Runner’s World magazine and provided with kit by various companies, but ran alone for most of the journey) and was pleased to happen across her book on our charity shop ramble in Stratford at the beginning of the year. When Rosie’s husband dies of cancer, she resolves to run around the world – as you do – to honour his memory and raise awareness of cancer; she also ends up raising awareness of and money for various charities along the way. Because this journey eventually takes five years, the book presents an outline of her journey and a series of vignettes (happily in order, or occasionally in well-signposted flashback) of her life on the road, concentrating mainly on the lovely people and animals (there is no sad animal stuff apart from a few partings) she meets along the way. The frightening experiences are far rarer than the heart-warming ones, and her calm efficiency and resourcefulness – as well as an ingrained and passionate respect for ordinary people and careful intention not to allow herself to be frightened, but always think the best of people – get her through various scrapes and danger. She is humble, grateful for help when she has to ask for it, and very, very resilient (OK, extremely hard! ), breaking several ribs along the way and not letting that stop her (she even runs through a set of dental treatment at one point!). She wasn’t a newbie at adventure, having completed the Marathon de Sables and a single-handed Atlantic sail, so she has already tested herself and knows she can do it, but she’s not a machine, and it’s a heartfelt, moving book, respectful and celebratory of people, animals and nature. It made me well up a good few times. I’ve just finished the lovely Gwen Raverat book I mentioned in my last post, and I’m contemplating whether to go Kindle or paper for my next read … Have any of my readers read either of these books (or run around the world?). 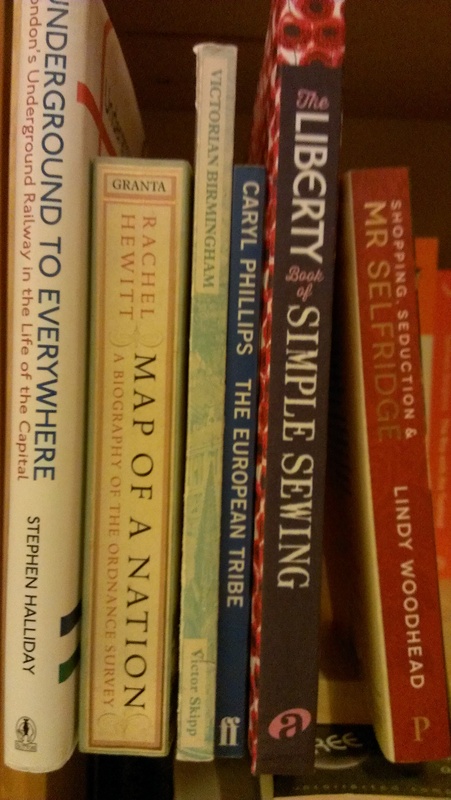 What do you think of books constructed from diaries or blog posts – do they always work? And, of course, what are you reading as the nights draw in? Oops. I knew the wonders of the September TBR weren’t going to last – have a look at the Book Confessions category to see how this has come to pass! Well, it’s not too bad still, and having lots of books to read can’t actually be BAD, can it? 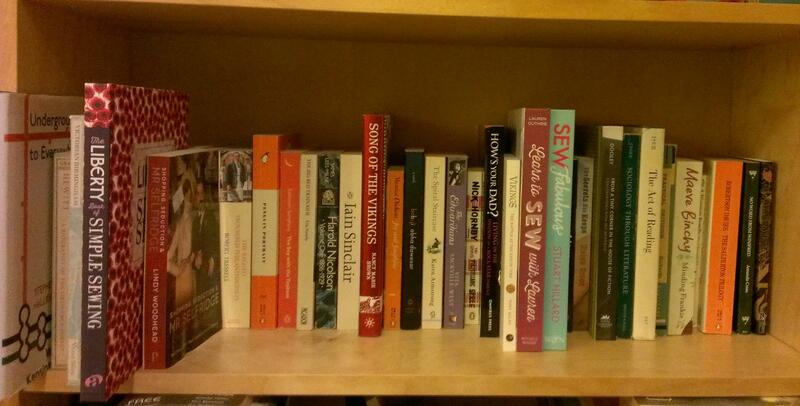 And if you go to author events and other events with books, it’s rude not to pick some up. Rude and unsupportive. So. I’ve done 30 of my Century of Books now, with two on the go (will I ever finish the Sartre book, though) with a few coming up in the next block of reading. Have you read any of these? What are you reading in October?